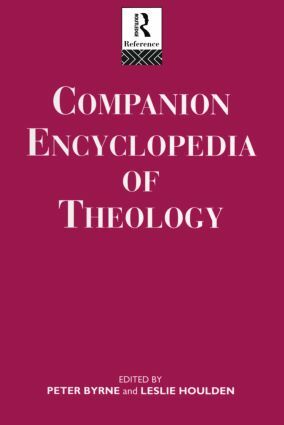 The Companion Encyclopedia of Theology provides a comprehensive guide to modern theological thought. An international team of theologians and practitioners of both the Christian and Jewish faiths investigate and consider aspects of theology in 48 self-contained articles. Neither partisan and denominational, nor detached and abstract, this Companion explores the resources and applications of theology in the light of Christianity's place in the modern world. The 48 essays are descriptive, informative and analytical; their wide-ranging content is bound into a unified perspective by the editors' general introduction and the introductions to each of the six parts. At the end of each article, there are suggestions for further reading and the work is concluded with a comprehensive index. This Companion Encyclopedia is a valuable source of reference for students, teachers and both lay and clerical practitioners of Christian and Jewish theology. Peter Byrne was educated at the Universities of York and Oxford. Since 1975 he has been a lecturer, now senior lecturer, in the philosophy of religion at King's College, London. He is co-editor of the journal Religious Studies and is the author of Natural Religion and the Nature of Religion (1989), The Philosophical and Theological Foundations of Ethics (1992) and Religion Defined and Explained (1993, with Peter B. Clarke).